Advantech has been at the forefront of industrial technology for over three decades now. A leading player in industrial computing, the company has been interconnecting and integrating industrial equipment since before the advent of IoT and Big Data. Together with the vast experience and the domain knowledge along with a robust industrial data platform which facilitates the development of industrial IoT solutions, Advantech is perfectly poised to address the challenges faced by solution providers. Rolled out in the early phases of 2018 after investing 4 years in its development, Advantech’s data platform, WISE-PaaS boasts of Edge Intelligence as one of its core components, supporting machine to intelligence through WISE-PaaS/ EdgeLink, remote data management through WISE-PaaS/EdgeSense, and intelligent video management through WISE-PaaS/VideoSense. Taking us deeper into its architecture, Allan says, “On top of Edge Intelligence sits the strong foundation of data platform layer, compatible with both public and private cloud. Based on widely implemented Cloud Foundry, this layer also features elastically scalable compute resource management such as data connectivity services that supports millions of devices connected and transmit IoT data. It also provides Database Services that augment variations such as MongoDB, InfluxDB, PostgreSQL and others suitable for different industries. Customer Management can be found parallel with leading authorization protocol OAuth 2.0 which strengthens identity authentication and resource access security to facilitate multi-tenancy and segregation of private data.” WISE-PaaS is further enhanced with value additions such as swift visualizations, dashboards and drag-and-drop capabilities, and AI-based analytics services. The third and final layer of the platform is AIoT Solutions Ready Package (SRP) which addresses the vertical-specific scenarios. Working on a co-creation model, Advantech’s data platform enables the partners to be nimble and flexible. One only has to integrate correct data based on specific domain knowledge and partners can leverage the benefits of the data-driven platform. Being highly scalable with cleanly segregated layers for data acquisition and management, and efficient AI models underneath, cocreation partners adopting WISEPaaS can experience significantly low R&D consumption during data acquisition, freeing up minds to engage in the business-specific layer i.e. SRP layer. 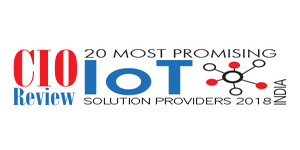 With actual solutions being developed by partners leveraging the company’s Edge platform together with WISE-PaaS along with the flexibility to choose data endpoints and the extensive edge connectivity, Advantech has emerged as a crucial player in the industrial IoT solutions ecosystem. A few verticals on which the company is focusing are in the Industrial 4.0 which includes intelligent manufacturing and smart city. From Phase 1, Advantech is progressing towards Phase-2 which is co-developing SRPs. Phase-3 involves collaborating with domain focused Solutions Integrators to take the ready-to-deploy industrial cloud solutions to different geographic regions.